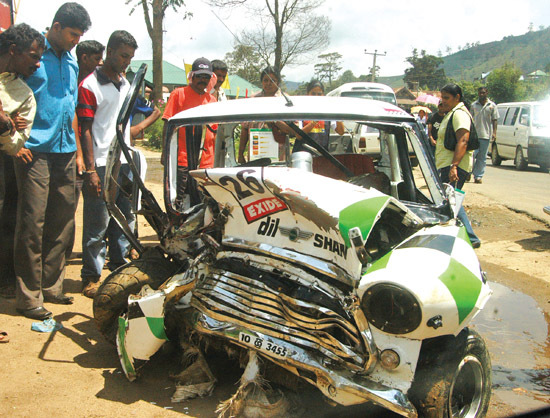 The crashed vehicle which Bandaranayake drove. Sri Lanka's Dilantha Malagamuwa taking part in four events won two second places in the Asian GT 4 two rounds on his newly acquired Aston Martin and finished seventh and eighth in the Porsche Carrera Cup Asia third and fourth rounds at the Shanghai Formula I track here in China yesterday. Upulwan Serasinghe the driver who has in the limelight in Ford Laser category for the past few seasons proved that he is a champion in this class when drove the his vehicle to win four events at the Fox Hill Super Cross on Saturday at the Diyatalawa circuit.